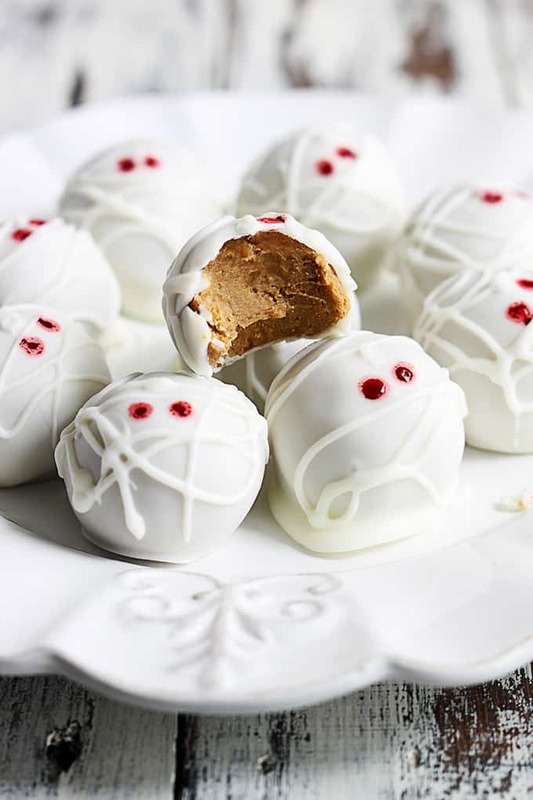 These no-bake Pumpkin Cheesecake Truffle Mummies are so easy to make and are perfect for Halloween parties! I can’t believe it’s October. Two seconds ago I was saying my goodbyes to summer and now we’re in the thick of fall. September seriously flew by way to fast, and that is killing me because this is my favorite time of year. I adore fall time and everything that comes with it. The first day I pull out my boots, scarves, sweaters, and cable knit socks is a very happy one. My house takes on a perma-smell of all things pumpkin spice, and pretty orange, gold, and red things start sprouting from nearly every flat surface in sight. Fall is my favorite time to decorate, even more so than Christmas. But my mother, she goes nuts for Halloween. It’s by far her favorite time to decorate and she has more decorations than you could imagine, each year adding to the collection. By the time she is finished putting everything up her house looks like a haunted victorian-era boutique, thanks to her obsession with antiques. I guess she passed her love of skeletons and witches on to the rest of my siblings because they throw a big Halloween party every year and the costumes they all wear would blow your mind. They seriously go all out for this party. My husband and I are more low-key and usually show up with a last-minute but totally clever couples costume we think is hilarious but everyone else doesn’t seem to quite appreciate. Last year, we went as Jack & Jill. We covered plain white t-shirts in grass stains and dirt, bandaged up my husband’s head, put my hair in pig tails and showed up to the party carrying a pail of water. Hilarious, right?? We thought so too. The best part of this annual family par-tay is the food. Everything is Halloween-themed. Last year I brought this Pumpkin Cream Cheese Cake (in the shape of an actual pumpkin, so cool) and this Mississippi “Blood” Pie. Both were a huge hit. 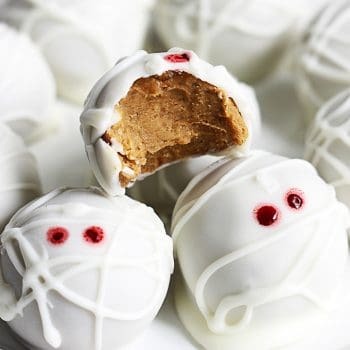 This year I’m bringing these pumpkin cheesecake truffles! They’re no bake, super easy, and totally delicious. 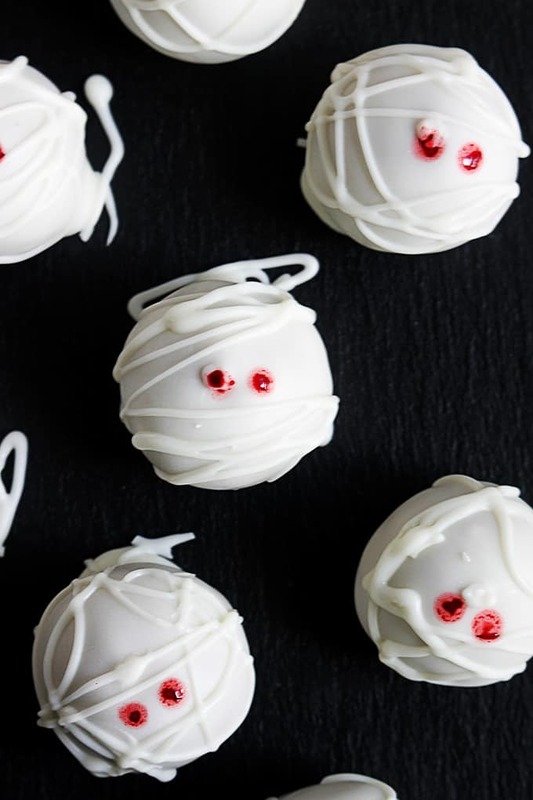 You can serve them up all season long but for the Halloween party I’m doing them mummy-style. Festive, fun, and CUTE! 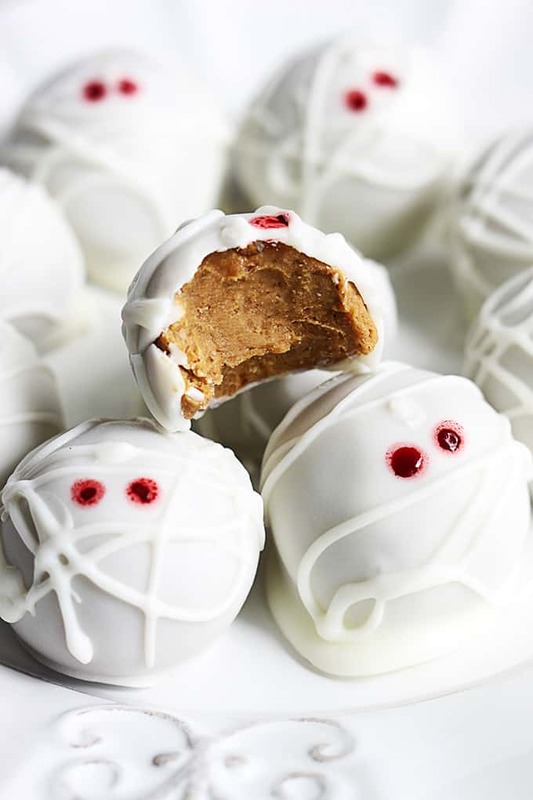 These no-bake pumpkin cheesecake truffles are so easy to make and are perfect for halloween parties! They are so yummy they will be the first thing to disappear at the dessert table! In a large bowl combine gingersnap crumbs, pumpkin puree, graham cracker crumbs, powdered sugar, cinnamon, salt, and cream cheese. Mix until smooth. Melt 1/2 cup white chocolate chips and mix into truffle mixture. Cover and chill until dough is solid enough to roll into balls - about 1 hour in the fridge or 30 minutes in the freezer. When cold enough, roll mixture into 12-14 balls. Place a toothpick in each ball. Melt remaining white chocolate chips or white dipping chocolate in a small bowl. 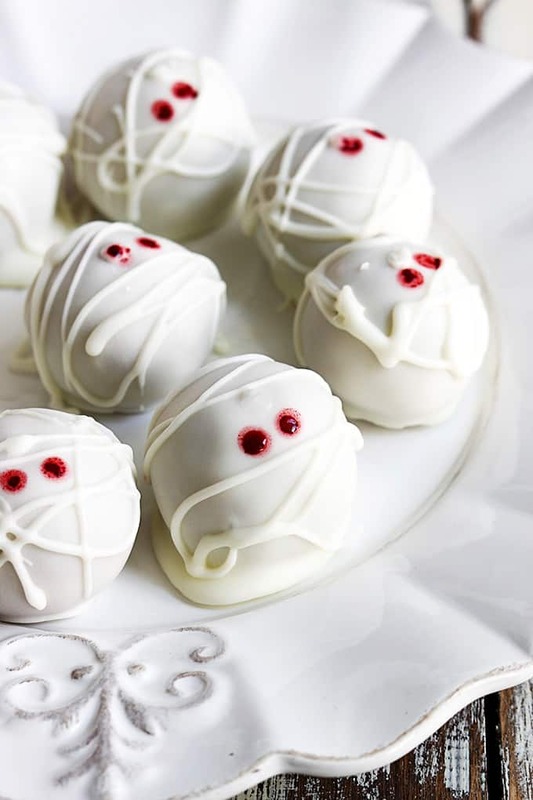 Use toothpicks to dip each truffle ball into the white chocolate, being sure to coat all sides. Gently shake off excess chocolate. Place chocolate-covered truffle balls on a baking sheet or plate lined with wax paper, parchment paper, or foil. Chill for 3-5 minutes until chocolate hardens. Drizzle more white chocolate over the truffles. Soak the end of a Q-tip in red food cloring. Dap 2 dots of food coloring to make the mummy eyes. Handle carefully so you don't wipe off the eyes. Store chilled in airtight container. Recipe adapted from Erin’s Food Files. These are completely adorable! Brilliant idea! These look unbelievably adorable I can’t cope! I’m going to make them tomorrow as a test run for halloween to bring into work. What would you suggest doing with the leftover pumpkin puree? And roughly how much chocolate should I melt to cover them and drizzle over to mummify them, maybe another 1/2 cup? Cute cute cute, your co workers will love them! For the chocolate drizzle, you don’t need much, maybe 1/4 cup of white chocolate chips/melting chocolate! I LOVE your costume idea! My family is all about clever ones, so they’d get a kick out of that. And it’s so true about fall weather and the boots, scarves and sweaters. If I could press pause permanently on fall weather so we could have pumpkin everything all year round, I would! These truffles are just the cutest; your family is going to love them if you bring them to the party this year! Pinned! These mummies are so fun! Pinning! I love these! So cute and so yummy! 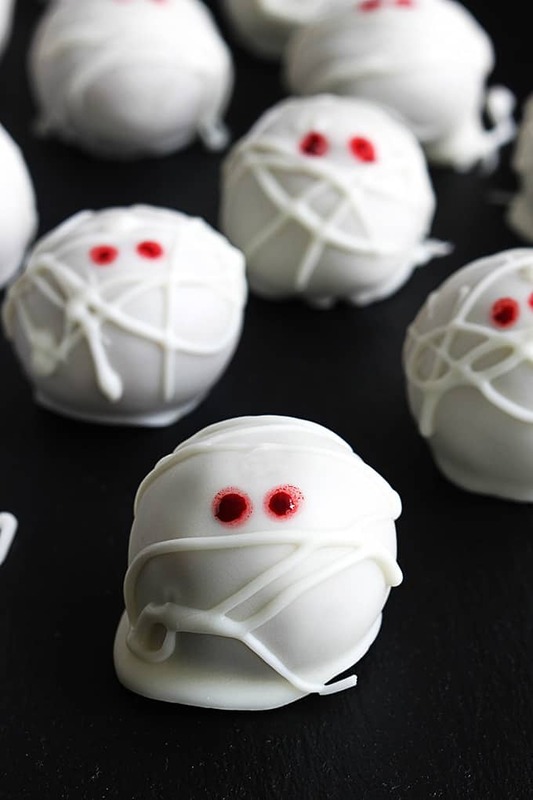 These are too cute, I really wanna make them for this Halloween! I have a question though, I live in Sweden, and unfortunately, gingersnap crumbs and graham crackers are nonexistent here. And while I assume I can just use some other type of crackers, the real problem is with gingersnaps, which I could find no Swedish equivalent of. Do you have any suggestion for what I might use instead? Or perhaps you could tell me what a gingersnap consists of, so that maybe I could find some good replacement for it? If you can find some other type of dry cookie or biscuit I think you could add ginger and cinnamon and get a similar flavor! These are adorable. I want to make ahead for party. How long do you think they would keep in refrigerator? Your mom and I would get on famously! I only have an apartment but we go all out on our Halloween decor, in which antique trunks, bottles and candlesticks play a huge role. Every year I also throw at least one Old Halloween Movie Party where we watch an old black and white horror film and make fun of it. I always make way too much food, because I just love Halloween recipes! This year for one of the parties we are watching the original 1932 Mummy move with Boris Karloff, and I was going to do a mummy/Egyptian theme, and these are perfect! Thank you, and happy Halloween! I attempted to make these but they were so gooey….I was so disappointed. They taste good but they were too gooey to try to dip in anything. I followed the directions to a t. I was going to try again with less cream cheese and pumpkin puree. Has anyone else had this issue? Were any adjustments successful? I doubled the recipe and decided to add more melted chocolate to the inner “gooey”part. It thickened it up great. After freezing for a little over 30 min it was perfect.. But I had to re freeze part way through rolling because it got too soft. How long can these stay out at room tempe? I’d probably say about an hour? After that I’d put them back in the fridge. How long can these stay out at room temperature? I want to make these for a party and was wondering how long they can sit out before melting? Thanks. These are so cute and I cannot wait to make these! Do you think these could also work as truffle pops? i tried to make these today, but failed miserably. somehow the mixture was too wet and dipping the so called balls to the chocolate was impossible. tried adding some cookie crumbs to it and i think it helped a little. also since i live in finland i couldn’t find actual gingersnap cookies or graham crackers. replaced them with gingerbread cookies and digestive biscuits. taste was extremely sweet and i’m looking forward to make another more succesful patch 😀 thank you for this awesome recipe! Hi do these truffles freeze well? Looks yummy, what size pumpkin purée? I actually made these last night for a Halloween Food Competition at work – the “presentation” Competition was fierce, but I did come in for Best Taste!!! THESE WERE AMAZINGLY DELICIOUS, I followed the recipe exactly and they were easy to make and came out perfectly! After reading comments I did use icing for eyes instead of food coloring, or the edible eyes would have been adorable too! These were a hit! Thank you so so much! Just made these and the taste is amazing but i dont know why my dough is Still soft. It was hard to form Them into smooth balls. Lani, not quite sure what happened to your dough! Sorry to hear that. But at least your flavor was correct!? Thanks for your feedback! At first these didn’t taste too much like pumpkin, so I added a little more pumpkin puree. After freezing it for an hour, the mixture was still too wet to dip in chocolate. thinning the chocolate with vegetable oil and drizzling it over the balls helped a little bit. Next time, I would add more cookie crumbs. Great taste, but the presentation didn’t turn out great for me. Irene- thanks for your feedback with these!